Russell C. Means, the charismatic Oglala Sioux who helped revive the warrior image of the American Indian in the 1970s with guerrilla-tactic protests that called attention to the nation’s history of injustices against its indigenous peoples, died on Monday at his ranch in Porcupine, S.D., on the Pine Ridge Indian Reservation. He was 72. Watch an interview with him here. The cause was esophageal cancer, which had spread recently to his tongue, lymph nodes and lungs, said Glenn Morris, Mr. Means’s legal representative. Told in the summer of 2011 that the cancer was inoperable, Mr. Means had already resolved to shun mainstream medical treatments in favor of herbal and other native remedies. Strapping, and ruggedly handsome in buckskins, with a scarred face, piercing dark eyes and raven braids that dangled to the waist, Mr. Means was, by his own account, a magnet for trouble — addicted to drugs and alcohol in his early years and later arrested repeatedly in violent clashes with rivals and the law. He was tried for abetting a murder, shot several times, stabbed once and imprisoned for a year for rioting. Parade in Denver in 2000. He styled himself a throwback to ancestors who resisted the westward expansion of the American frontier. With theatrical protests that brought national attention to poverty and discrimination suffered by his people, he became arguably the nation’s best-known Indian since Sitting Bull and Crazy Horse. But critics, including many Indians, called him a tireless self-promoter who capitalized on his angry-rebel notoriety by running quixotic races for the presidency and the governorship of New Mexico, by acting in dozens of movies — notably in a principal role in “The Last of the Mohicans”(1992) — and by writing and recording music commercially with Indian warrior and heritage themes. He rose to national attention as a leader of the American Indian Movement in 1970 by directing a band of Indian protesters who seized the Mayflower II ship replica at Plymouth, Mass., on Thanksgiving Day. The boisterous confrontation between Indians and costumed “Pilgrims” attracted network television coverage and made Mr. Means an overnight hero to dissident Indians and sympathetic whites. Later, he orchestrated an Indian prayer vigil atop the federal monument of sculptured presidential heads at Mount Rushmore, S.D., to dramatize Lakota claims to Black Hills land. In 1972, he organized cross-country caravans converging on Washington to protest a century of broken treaties, and led an occupation of the Bureau of Indian Affairs. He also attacked the “Chief Wahoo” mascot of the Cleveland Indians baseball team, a toothy Indian caricature that he called racist and demeaning. It is still used. And in a 1973 protest covered by the national news media for months, he led hundreds of Indians and white sympathizers in an occupation of Wounded Knee, S.D., site of the 1890 massacre of some 350 Lakota men, women and children in the last major conflict of the American Indian wars. The protesters demanded strict federal adherence to old Indian treaties, and an end to what they called corrupt tribal governments. In the ensuing 71-day standoff with federal agents, thousands of shots were fired, two Indians were killed and an agent was paralyzed. 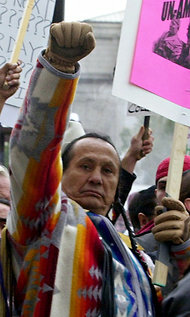 Mr. Means and his fellow protest leader Dennis Banks were charged with assault, larceny and conspiracy. 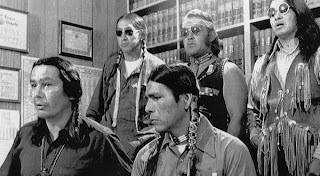 But after a long federal trial in Minnesota in 1974, with the defense raising current and historic Indian grievances, the case was dismissed by a judge for prosecutorial misconduct. Mr. Means later faced other legal battles. In 1976, he was acquitted in a jury trial in Rapid City, S.D., of abetting a murder in a barroom brawl. Wanted on six warrants in two states, he was convicted of involvement in a 1974 riot during a clash between the police and Indian activists outside a Sioux Falls, S.D., courthouse. He served a year in a state prison, where he was stabbed by another inmate. Mr. Means also survived several gunshots — one in the abdomen fired during a scuffle with an Indian Affairs police officer in North Dakota in 1975, one that grazed his forehead in what he called a drive-by assassination attempt on the Rosebud Indian Reservation in South Dakota in 1975, and one in the chest fired by another would-be assassin on another South Dakota reservation in 1976. Russell Charles Means was born on the Pine Ridge reservation on Nov. 10, 1939, the oldest of four sons of Harold and Theodora Feather Means. The Anglo-Saxon surname was that of a great-grandfather. When he was 3, the family moved to the San Francisco Bay area, where his father, a welder and auto mechanic, worked in wartime shipyards. Russell attended public schools in Vallejo and San Leandro High School, where he faced racial taunts, had poor grades and barely graduated in 1958. He drifted into delinquency, drugs, alcoholism and street fights. He also attended four colleges, including Arizona State at Tempe, but did not earn a degree. For much of the 1960s he rambled about the West, working as a janitor, printer, cowboy and dance instructor. In 1969, he took a job with the Rosebud Sioux tribal council in South Dakota. Within months he moved to Cleveland and became founding director of a government-financed center helping Indians adapt to urban life. 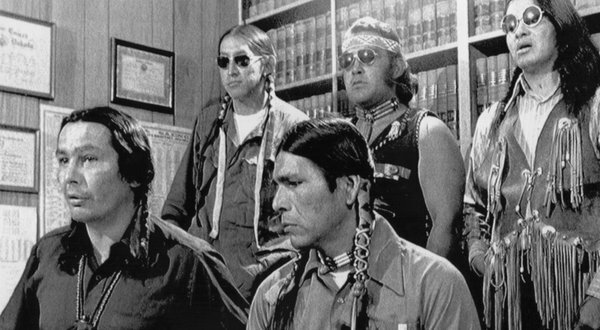 He also met Mr. Banks, who had recently co-founded the American Indian Movement. In 1970, Mr. Means became the movement’s national director, and over the next decade his actions made him a household name. In 1985 and 1986, he went to Nicaragua to support indigenous Miskito Indians whose autonomy was threatened by the leftist Sandinista government. He reported Sandinista atrocities against the Indians and urged the Reagan administration to aid the victims. Millions in aid went to some anti-Sandinista groups, but a leader of the Miskito Indian rebels, Brooklyn Rivera, said his followers had not received any of that aid. In 1987, Mr. Means ran for president. He sought the Libertarian Party nomination but lost to Ron Paul, a former and future congressman from Texas. In 2002, Mr. Means campaigned independently for the New Mexico governorship but was barred procedurally from the ballot. 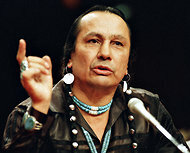 Mr. Means retired from the American Indian Movement in 1988, but its leaders, with whom he had feuded for years, scoffed, saying he had “retired” six times previously. They generally disowned him and his work, calling him an opportunist out for political and financial gain. In 1989, he told Congress that there was “rampant graft and corruption” in tribal governments and federal programs assisting American Indians. Mr. Means began his acting career in 1992 with “The Last of the Mohicans,” Michael Mann’s adaptation of the James Fenimore Cooper novel, in which he played Chingachgook opposite Daniel Day-Lewis and Madeleine Stowe. Over two decades he appeared in more than 30 films and television productions, including “Natural Born Killers” (1994) and “Pathfinder” (2007). He also recorded CDs, including “Electric Warrior: The Sound of Indian America” (1993), and wrote a memoir, “Where White Men Fear to Tread” (1995, with Marvin J. Wolf). He was married and divorced four times and had nine children. He also adopted many others following Lakota tradition. His fifth marriage, to Pearl Daniels, was in 1999, and she survives him. Mr. Means cut off his braids a few months before receiving his cancer diagnosis. It was, he said in an interview last October, a gesture of mourning for his people. In Lakota lore, he explained, the hair holds memories, and mourners often cut it to release those memories, and the people in them, to the spirit world.